In an idyllic setting among rocks and pine trees, the Illa Roja beach is known for its clear waters and the prominent reddish rocky island that presides over it, giving it its name ('Red Island'). It's a quiet, uncrowded spot with coarse golden sand and a pronounced slope heading down to the sea – and it's a nudist beach with international prestige, so it draws its share of foreign tourists. The only way there is via a lovely path along the coast, which, together with the wild environs and ravines surrounding it, contribute to its reputation as a small, hidden oasis tucked away in the wilderness. The beach is under a cliff that divides it into two. It's 150 metres long, depending on the tide, which can connect the rocky island by land or leave it floating in the sea. 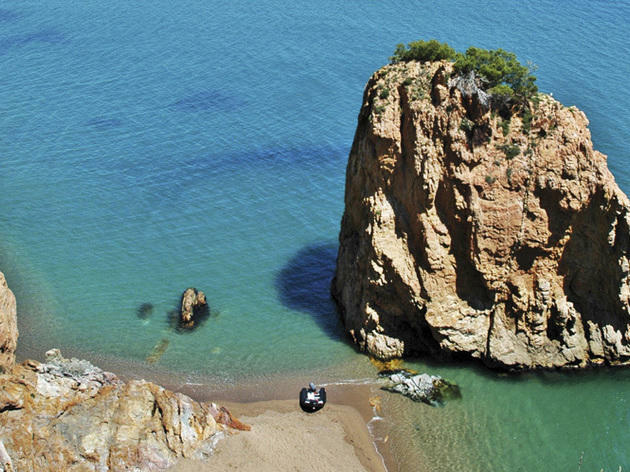 Since it's completely surrounded by high rock walls and vegetation, Illa Roja gets fewer hours of sunshine than other beaches in the area – such as the big sandy space occupied by Pals Bay – so by mid-afternoon the cove is practically shaded over. This won't pose a problem as long as you keep in mind that there are other charming beaches nearby, including Sa Riera, Platja del Raco, and, a little farther away, Aiguafreda and Sa Tuna. There aren't any services at Illa Roja other than a small snack bar that's usually open only during summer. Don't forget to wear good shoes, so you can walk along the beach, and if you've got the kids, take along something for them to float with. Getting there: By car, take the A-7, exit 6 twoard Palamós-La Bisbal. Continue along the C-255 and when it joins up with the GI-653, take that to Begur. 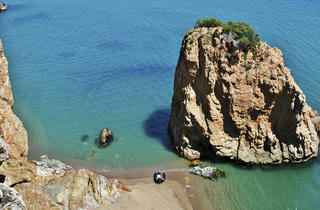 Carry on until you get to the Cala de Sa Riera, where you'll then walk along the path to Illa Roja.